To hear Peter’s story read by Eric Duff; please press play on the audio file. Peter McDonald was born in Perth on 22nd February 1893; he was the seventh of eight children. His parents, George and Helen McDonald, lived at Burnside, Scone at one time. His father had various jobs, including policeman and gardener. This meant that Peter was educated in various schools in Perthshire as the family moved when his father changed jobs. Peter emigrated to New York, where he worked as a valet for some time to a private gentleman. He enlisted into the British Army in New York on 6th June 1917. 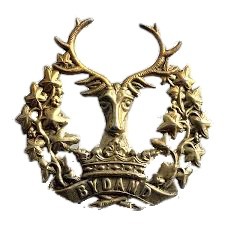 On returning to Scotland he joined the 6th Bn Gordon Highlanders. Peter was mobilised to France in November 1917 and took part in the Battle of Cambrai between the 20th and 30th November 1917. He was discharged from the army on 15th March 1918 with total disability. He returned home to live with his parents in Scone. Private Peter McDonald died on the 4th August 1918 from tuberculosis. He was 25 years of age. He is buried in Scone Cemetery, Plot D89. Peter was entitled to the Victory and British War medals.